Tallarook is a rural village and district in central northern Victoria, 10 km south of Seymour. It is on the railway line from Melbourne and on the Hume Freeway, which pass between hilly ranges east and west of the township. Tallarook was the name of a pastoral run supposedly originating with the overlander, Joseph Hawdon, in 1838. In any event there was a Tallarook homestead constructed in 1841 or 1842 when the run was tenured by the Jamieson brothers. The run adjoined the Goulburn River and the King Parrot Creek, extending almost from the present village to Seymour. In 1855 river flats in the Tallarook pastoral run were sold as farms, which were used for growing cereals, dairying and fattening of stock. A school was opened in 1864, and another about 5 km to the north in 1867, where Dysart railway siding was later situated. 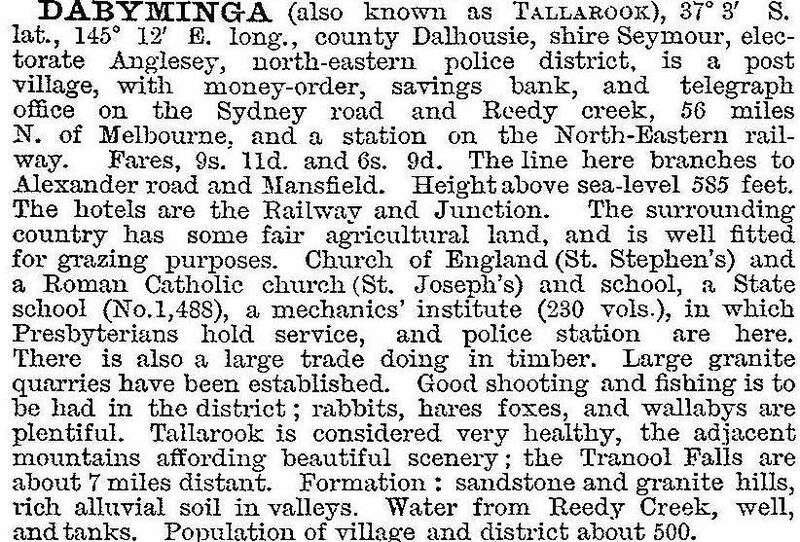 In 1872 the railway to Seymour came through Tallarook, and the station served as a transport point for local sawmills. Between 1882 and 1891 Tallarook became an increasingly active railway junction as a line was opened eastwards to Yea and Mansfield (1891-1978). An Anglican church was opened in 1884, and the second Catholic church, St Joseph’s was opened three years later. A mechanics’ institute was built in 1891. Sporting activities were added to Tallarook: the local football team were premiers for six consecutive years during the 1890s, and golf and tennis facilities were provided in the early decades of the next century. The Hume Highway passes through the township, but since the early 1980s it has been quieter with the nearby freeway carrying most traffic. The school has continued (71 pupils, 2014) and there are two churches, the mechanics’ institute, a hotel with a private cricket oval and tennis and golf clubs. Farming of Boer goats started in the early 2000s, which saw some properties previously overrun with Sifton bush become arable pasture again, reshaping the landscape.